Carpet inserts add that little bit extra to a spacesaver staircase and they may be added to all of our spacesaver staircases, with the exception of the Budget spacesaver staircase range, during production. To accommodate the carpet inserts, the treads of the steps are recessed during manufacture to ensure the carpet remains flush with the tread. Customers may choose from a palette of standard carpet colours or may insert their own carpet to match their decor after installation. As the carpet pieces are recessed into the stair tread, they may be changed with relative ease to match any future redecoration around the staircase. 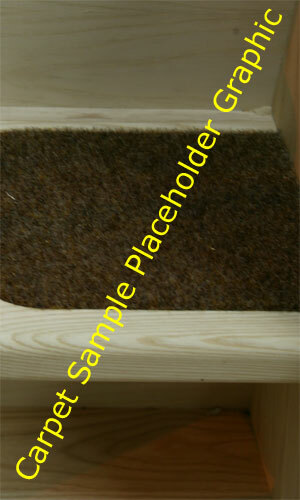 Carpet inserts on a spacesaver staircase that has a quarter landing will generally only be added to the paddle of the step, not the whole quarter landing. To request a quotation for a spacesaver staircase with carpet inserts, navigate to one of our standard spacesaver staircases using the links on the left and use the enquiry form at the bottom of the page. Alternatively, you can give one of our sales advisors a call on 01952 6208853, to place an order, for a quotation or further advice. Note images are placeholders on development site to show concept only! We need your email address to send a quotation by email and your phone number in case we have any questions. We will not use this information for any purpose except to respond to your request!